Resplendent regal palaces and romantic backdrops - Rajasthan is the land of mystical weddings and grandeur. What better way to make your dream wedding come true than a palace wedding? Rajasthan, the land of the kings, is one of the most culturally-rich states in India. If you are looking for some elegant and exotic wedding venues, then Rajasthan provides majestic palaces to satisfy your visual curiosity. Here’s the list of the best palace wedding venues that will leave you gasping for breath. Make your wedding celebrations grand by hosting it at the magnificent Neemrana Fort Palace. This majestic structure was built in 1464 and is considered to be one of the exotic wedding destinations in India. The palace has seven wings built across 6 acres of garden palace. Nothing can get more grand than hosting your wedding ceremony at this stunning fort as it gives you a glimpse of its royal past that eventually blends into your wedding preparations in some way or the other. Neemrana has been a spectator to grand weddings since 1992 and offers a stylish banquet hall along with two beautiful lawn areas for hosting an intimate wedding ceremony. Built on an island amidst Lake Pichola, Jagmandir Palace is the ideal romantic setting for couples planning a wedding with splendour. 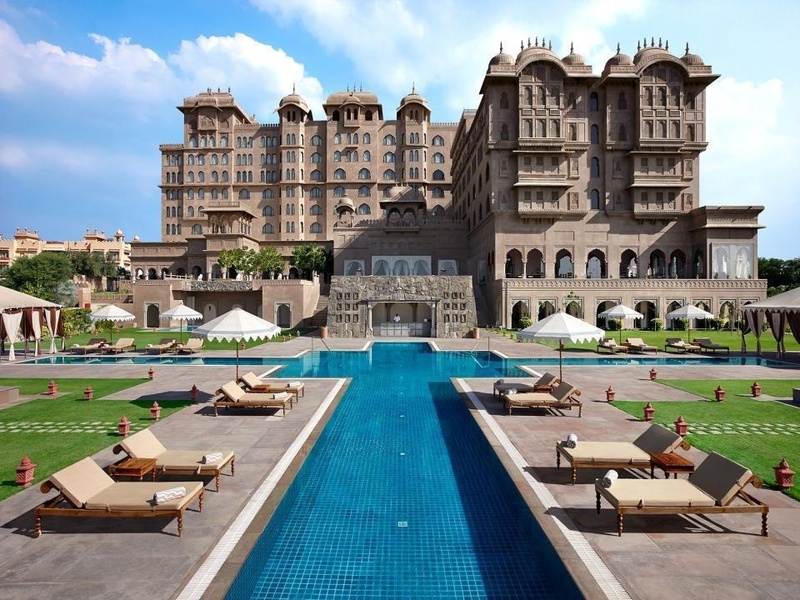 The magnificent palace is built in marble and yellow sandstone with a spectacular view of the City Palace Complex. Popularly known as the ‘swarg ki vatika or garden or heaven’, the venue proves to be an idyllic place for couples to tie the knot. The venue comprises of three majestic, well-maintained garden areas that are befitting to host wedding ceremonies on a grand scale. Till date, the weddings hosted at Jagmandir Palace have always generated a lot of buzz for its glamour and exclusivity. The beautiful City Palace Udaipur- Fateh Prakash Palace is situated on the shores of Lake Pichola and is reminiscent of the bygone era in Rajasthan. The Darbar Hall has historical significance and is one of the main features of this beautiful palace. It also consists of two well-manicured lawn areas and a spacious terrace area for hosting pre-wedding and other wedding functions. The interiors of this palace are soaked in the history of Rajasthan with each wall narrating you a story about the Mewar dynasty. The rooms are well-equipped and decorated with traditional, original paintings and antique furniture, and you can enjoy the view of the beautiful Lake from the arched windows of your room. Nestled amidst the breathtaking Aravalli ranges, Fairmont Jaipur has paid a tribute to the Pink City, which one can easily see in the hotel’s décor and architecture. The palace setting is heavily inspired by the Mughal dynasty and Rajput dynasty. Each room has a décor that speaks of its own and has a distinct style to it. The multiple banquet halls, especially the Grand Ballroom is best suited for grand wedding celebrations. If you wish for an open space wedding ceremony, the GBR Lawn is the best bet. If you plan on hosting your wedding at this venue, you can be rest assured that all your wedding preparations (big or small) will be well taken care of. Le Meridien is a magnificent structure with a rich cultural history of the city as its backdrop. The sprawling premise has four sumptuous banquet halls and five majestic lawn areas to organise weddings on a large scale. The lavish property has some state-of-the-art facilities and the staff is well trained and hospitable. The primeval accommodation provided by the venue speaks widely about the Rajasthani culture that is significant in the architecture present at the venue. The splendid Radisson Blu Resort and Spa is based on the banks of the Fateh Sagar Lake and offers a spectacular view of the entire Lake City. The palace is centrally located and provides a beautiful view of the vast lake and high mountain ranges. The hotel offers world-class service and upscale amenities. Apart from having multiple hall and garden areas for various wedding ceremonies, the hotel’s cascading waterfall enhances its beauty. The modern décor and interiors add a royal touch to any wedding ceremony held here. Speaking of grandeur and palaces, there’s no way that Sujan Rajmahal does not make it to this list! This spectacular and majestic palace is also one of the oldest palaces in the city of Jaipur. The palace has beautiful marble staircases and well-furnished rooms, where each of the rooms is different from the other in terms of structure and interiors. There are three banquet halls for small pre-wedding functions, reception parties and two plush lawn areas for other major wedding functions. The palace is available for a period of 2 days for a fixed cost so that you can host a hassle-free wedding ceremony. The city of Udaipur is also home to one of the stunning palaces- Fatehgarh. Every nook and corner of the palace speaks volumes of the immense cultural heritage prevalent in the city. The glorious palace provides a 360-degree view of the majestic mountain ranges and the entire city from up there. It has a ‘larger than life’ feeling, making it suitable for grand celebrations. The recycled doorways and elaborate use of wood lend an interesting touch. A pioneer in the hospitality sector, the Leela Palace in Udaipur stands true to its name. Situated amidst clear lakes and stunning mountain ranges, this venue has been the epitome of romance and splendor, which in turn has inspired poets across generations. The stunning palace evokes the grandeur of an era long gone that is prominent in the venue’s architecture and holds a lot of significance. So, if you’re someone who wants nature at its best and doesn’t want to compromise on the ‘grand’ factor, then this is the wedding destination for you! For a long time, Devigarh has been witness to some of the grand weddings held in the city of Udaipur. The palace has thoughtfully done the décor and styling, with an extensive usage of white marble in its construction. Apart from hosting a lot of celebrity weddings and other events, a couple of movies have been shot at this stunning venue. Its garden area is ideal for hosting small, intimate gatherings. So, here is a list of the most spectacular palaces if you ever wish to host your wedding amidst much fanfare. If you’d like to add any palaces to this list or you've had a stunning wedding at one of these venues, share your experiences with us at content@weddingz.in.